There are a lot of invisible teams in the NBA - teams that go about their business without drawing a whole lot of interest or attention. They are just there - the vanilla ice cream of the league. From where I sit the Indiana Pacers are definitely one of those teams. I'm sitting in a coffee shop writing this right now. I bet that if I asked the 20 people here what the NBA team in Indianapolis is called, not half would know the answer. And even among those that call themselves basketball fans to some degree I bet not more than one would be able to name their current number of wins within, say, five. Granted, I don't live in a basketball heartland, but you get my point. Playoff positioning: With 11 games left the Pacers sit in seventh place in the East, and they have a 2.5-game cushion on co-ninth place inhabitants Detroit and Chicago. Chicago has lost seven of 10 and Detroit has dropped six of 10, so the Pacers don't have a lot to fear from behind. They can't take a playoff spot for granted, but they have to focus on positioning as much as qualifying at this point. They are a game ahead of Miami in eighth and currently have the same record as the Bucks in sixth, but not the tiebreak right now. They are also just a game behind Atlanta in fifth. The Hawks have lost seven of 10 so they could be vulnerable, but Milwaukee is red hot and would have to be favored if one team is going to pass the Hawks. So, they aren't going to host a playoff series, but they could play anywhere from fifth to eighth. The question, then, is where is the best place to finish? Seventh or eighth means Cleveland or Boston in the first round. You don't want that. Washington and Toronto aren't a whole lot better, but they are definitely a little easier to play against right now. So, the motivation should be high over the last 11 games to move forward and not back. Schedule: So, do they have the schedule to keep moving forward? It could be worse. They play Philadelphia twice, Orlando and Minnesota, so there are some softer games among the 11. They also have plenty of opportunities to take charge of their own destiny - they play Toronto twice, Cleveland, Milwaukee and Atlanta, so there are plenty of divisional games that can make a statement and gain ground quickly. The team probably needs to win at least seven of their final 11 to move into fifth or sixth. That's not impossible. The biggest issue, though, is that they have been fine lately but haven't been tearing things up. They are just 7-7 in their last 14 and have neither won twice in a row or lost twice in a row in that time. Jeff Teague: The Pacers made a bold move in the offseason, dealing point guard George Hill to the Jazz and bringing in Jeff Teague from Atlanta in a three-team deal. Utah has no regrets - Hill is having no regrets. The Pacers can't be upset either, though - they are getting solidly more production at the point than they did last year, and Teague is definitely making this team better. He wasn't scoring particularly well for the first part of March, but he has turned it around nicely. He's a looming free agent and he'll have lots of options, so that's an issue for the team and a potential distraction for him. Hopefully they can both ignore that until the season ends. 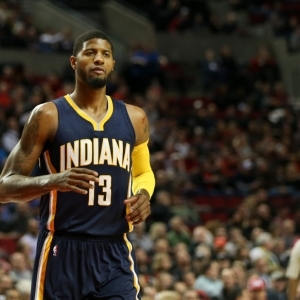 Paul George: It seemed inevitable at the trade deadline that George was going to be dealt. It's probably no surprise, then, that his game has definitely elevated since the deadline passed and he was certain he wasn't moving. The deadline was in late February. He averaged 17.8 points and 6.6 rebounds in February and has leapt way up to 26.7 points and 7.5 rebounds this month. If he can keep it up then that obviously helps the team. It's far from guaranteed that they will succeed when he shines, though - he scored 37 in a stellar outing against the Celtics last time out, but Teague with 25 was the only other scorer in double digits and Boston won by nine. So, George's high performance level is crucial but not sufficient if this team wants to accomplish anything. Betting performance: This has not been a particularly fun team to bet on. They sit at 32-38-1 ATS, which is a long way from profitable and ranks a dismal 23rd in the league in terms of betting performance. They have gone "under" the total 37 times and "over" 34, so there has been no long-term profit to be made on the totals, either.